Changing the rules to make it easier for a thrilling extra-inning game to be concluded. Is this a trend of the times? The Japan High School Baseball Federation has decided to introduce a tiebreak system for extra-inning games, starting with next spring’s annual National High School Baseball Invitational Tournament. The system is also likely to be adopted in the National High School Baseball Championship, another annual tournament held in the summer. The tiebreak system is a special rule requiring extra-inning offensive play to be started in a situation where a run can be scored easily. If a game is tied at the end of the 12th inning, according to a proposal under consideration, from the 13th inning the first batter will stand in the batter’s box with no outs and runners on first and second. The federation, known as Nihon Koyaren, cites the need to “protect the physical condition of high school students, who are still growing,” as the primary reason for the introduction of the system. In this spring’s invitational tournament, six games continued into extra innings, and two ended in the 15th inning with the score still tied, followed by rematches. One pitcher made more than 300 throws in two games, including the rematch. Pitchers will be even more greatly exhausted in games fought in the summer high school baseball championship, as that tournament is held in the intense heat. The tiebreak system will be effective, to a certain extent, in preventing pitchers from using their arms too much and suffering other harm. The system is already used in various tournaments, including the Intercity Baseball Tournament, a championship for company-sponsored nonprofessional teams of working adults. It is also used in the Japan National Collegiate Baseball Championship, the World Baseball Classic and the U-18 Baseball World Cup. There is said to be a growing need for high school baseball players and their coaches to become accustomed to the system in preparation for international competitions. During the past 10 years, however, only 10 games have lasted until the end of the 13th or later innings in the spring and summer high school baseball championships, both of which are held in Koshien Stadium. Extra-inning games cannot necessarily be described as the primary cause of the excessive burden on high school baseball players. 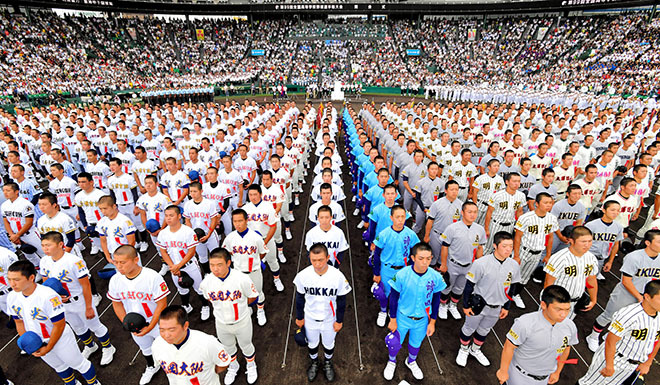 It is possible to guess that the introduction of the system reflects the convenience of those involved in sponsoring the high school baseball championships, such as Koyaren, who attach importance to steady progress through the schedule of games. Extra-inning games and rematches following ties in Koshien Stadium have produced many historic dramas. They include the close game between Matsuyama Commercial High School and Misawa High School in the summer of 1969, which ended scoreless in the 18th inning, resulting in a rematch. This story is still told today. Another unforgettable game was the one between Yokohama High School and PL Gakuen in the summer of 1998, in which Daisuke Matsuzaka of Yokohama fought it out until the 17th inning with 250 throws. Many baseball fans may feel a tinge of sadness about the adoption of the tiebreak system, which arranges for games to be concluded with ease. There are some teenage players who want to fight out a game until the winner is decided purely through the score in the grand Koshien setting. Needless to say, it is important to take measures to prevent high school baseball players from suffering harm. To prevent pitchers from playing in consecutive games, it is indispensable to set up unhurried game schedules by giving participating teams more days to rest, for example. Inventive efforts need to be made in this respect, such as reducing the number of training days at Koshien Stadium prior to the opening of the national tournaments. To enable high school players to compete in ideal condition, we hope Nihon Koyaren will continue to discuss necessary measures from various points of view, not just introducing the tiebreak system.